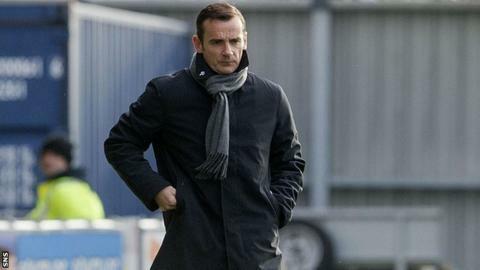 Danny Lennon hopes "the underdog can have their day" when St Mirren take on Celtic in Sunday's Scottish Communities League Cup semi-final. The Buddies travel to Hampden hoping to defy the odds against the tournament favourites. And Lennon is seeking inspiration from notable cup upsets, such as Celtic's 1-0 defeat by Kilmarnock in last season's final. "I certainly believe that miracles do happen," Lennon told BBC Scotland. "More often than not the hungrier team wins and I certainly hope that's us on Sunday. "We're certainly not just going there just to enjoy the occasion. We want to go and make it an occasion. "We have to make sure that we bring our key strengths. We've got to show bravery, confidence and a lot of desire and work rate." St Mirren hope to have available, with the forward awaiting international clearance following his move from Rio Ave in his native Portugal. "A coach at my old club told me about St Mirren and said he thought it would be a good move for me," said the 21-year-old. "He thought I could come here and score goals so I said yes to the chance. "I had only played with eight games with Rio Ave this season, that is all. I was frustrated. "I trained with the squad this morning and the standard was good. I'm not sure what will happen once my loan is up. We will see. It depends how I play." And Lennon said of his new signing: "He's one that was on our radar, he's got a good pedigree. He's a young lad. "I think it says a lot for the boy that he wants to come over here and prove a point and contribute to Scottish football. "He'll do that incredibly well. He's had good experience against big clubs. "He's quick, strong, technically, he's got an eye for goal. There's no doubt that he'll help our group."